SY-LAB´s RiboFlow® technology signals relevant bacterial food contamination on-site—early, quickly, and reliably reducing the need for sophisticated sampling and amplification techniques. Rapid results are critical when testing for harmful pathogens in foods. RiboFlow® technology represents a new, usensitive and user-friendly class of diagnostics: Molecular Flow-Based Detection. The unique horizontal flow technology allows for the specificity of PCR tests, but with the ease of use associated with lateral flow assays. 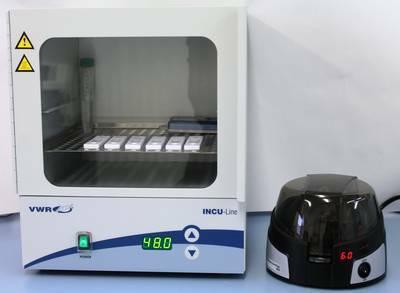 The result is an effective and rapid system that minimizes sample preparation, speeds time to results, and provides easy to interpret data for the end user. 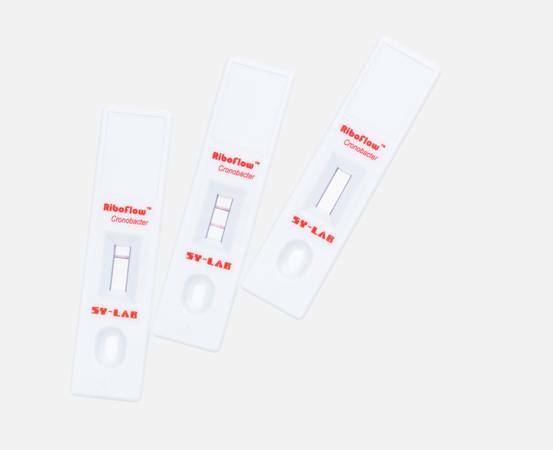 The RiboFlow® technology is an advance over current diagnostic capabilities, providing molecular results in an easy to use format and without cumbersome sample preparation steps. NO gels, NO expensive machines, NO inconclusive and difficult to interpret results. Fast, easier, and more affordable than conventional molecular tests—SY-LAB´s RiboFlow® Technology is the next generation in powerful diagnostic tools to help manufacturers and government regulators keep the global food supply safe. A combination of the rapid and easy to use lateral flow technology with the very sensitive and specific nucleic acid hybridisation technique has resulted in this unique rapid assay format. Using specific ribosomal RNA (rRNA) sequences that are abundant in multiplying cells as a target, a reliable detection many pathogens is possible within 24 hours including enrichment. Ribosomal RNA in crude lysates of enrichment cultures is detected within 15 min by hybridisation with a capture probe on the membrane integrated inside a lateral flow test housing and a detection probe conjugated to colloidal gold. After cell lysis and equilibration in hybridisation buffer the lysed cell supernatant is applied to the sample pad of the lateral flow device. The specific target sequence in case of a positive sample as well as the inbuilt reaction control will than hybridise to the specific capture probe and be visualised on the reaction zone without additional user interference. What is new about RiboFlow technology? RiboFlow is the world's first test system which is capable of specifically detecting bacterial ribosomal RNA directly from a crude cell lysate using a simple lateral flow format without further chemical or enzymatic amplification. For this achievement, SY-LAB Geraete GmbH was awarded a prize for innovation in 2011. Why is RiboFlow preferable to an immunological lateral flow assay? 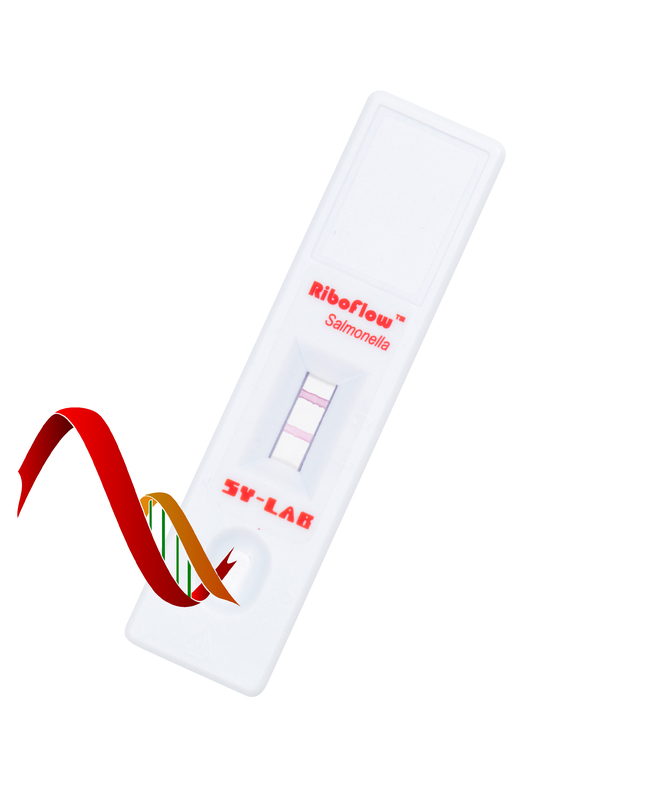 The detection of a microorganism by the RiboFlow technology is based on nucleic acid hybridization of ribosomal RNA sequences specific for the target microorganism. This reaction causes much less cross-reactivity than the reaction of antibodies with microbial surface antigens at similar or even higher sensitivity. Therefore, the RiboFlow shows improved specificity in comparison with immunological tests. Does one need sophisticated equipment to perform a RiboFlow test? No. All you need for carrying out the procedure are an incubator, micropipettes with sterile pipette tips and a small centrifuge. What kind of education or training is needed to perform the test? No special skills are required to carry out the RiboFlow protocol. 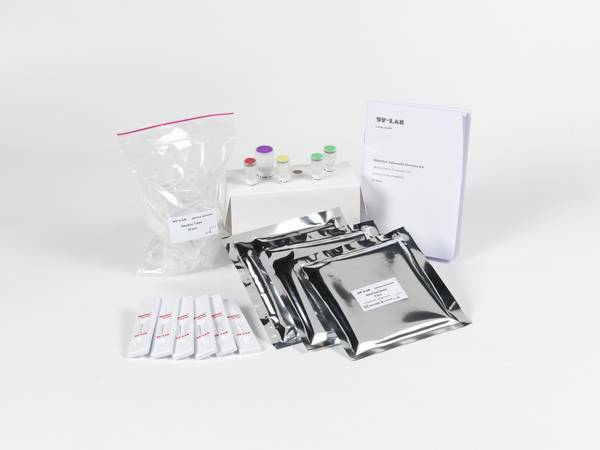 Is it necessary to observe any special storage conditions for RiboFlow test kits? No, long-term storage can be carried out at +2 to +25 °C. 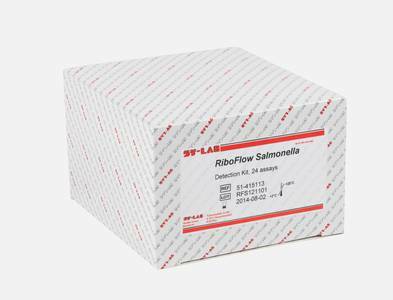 Which types of samples can be analyzed with RiboFlow kits? The detection of the target organism by RiboFlow is possible from selective enrichments, suspicious single colonies, positive measuring cells from impedance analysis and in some cases even pre-enrichments. Are special precautions in handling the kit required? No, just the usual laboratory safety measures related to handling enriched samples and chemicals. How is a consistent quality of the product ensured? Quality control is performed for every batch produced by verifying the specified analytical detection limits and by testing with various positive and negative controls. What exactly is actually detected in RiboFlow? Ribosomal RNA together with the ribosomal proteins is part of the protein synthesis apparatus of a cell. Many bacterial species or related groups of bacteria have certain regions in their ribosomal RNA which are very specific in their base sequence. Such specific regions in the RNA sequence are detected with the RiboFlow from crudely extracted bacterial cells (lysates). How long is the test procedure? The total duration of RiboFlow lateral flow tests, depending on target microorganism and method used, is about 25 to 35 minutes. Why should the test be performed with fresh cultures? Because only relatively fresh cultures are still metabolically active and synthesize ribosomal RNA in sufficient quantities. In old cultures, RNA is degraded with time, and thus fewer molecules are available for detection. Therefore it is important to use fresh cultures for maximum sensitivity. But then how can you keep samples for later analysis, if a timely testing is not possible? If necessary, the bacterial cultures can be centrifuged and the clear supernatant removed. The bacteria can then be stored either directly as bacterial precipitate after centrifugation or as a lysate after re-suspension in Solution A ( from the RiboFlow Kit) for several weeks at -20 °C. Why is it so important to follow the indicated temperatures and times and to evaluate the test immediately after completion of the reaction time? The sequences in the detected regions of the ribosomal RNA are often very similar in closely related species. Strict compliance with the stated reaction conditions prevents possible cross-reactivity of the test with closely related bacterial species and thus ensures the highest possible specificity. Why is RiboFlow Cronobacter, in combination with "Cronobacter Enrichment Broth" or BacTrac screening, superior to the standard method? The standard method (ISO / TS 22964:2006) involves the use of a selective medium containing lauryl sulfate. Some Cronobacter strains are lauryl sulfate sensitive, exhibit no growth in this medium and are therefore not detected with the standard method. 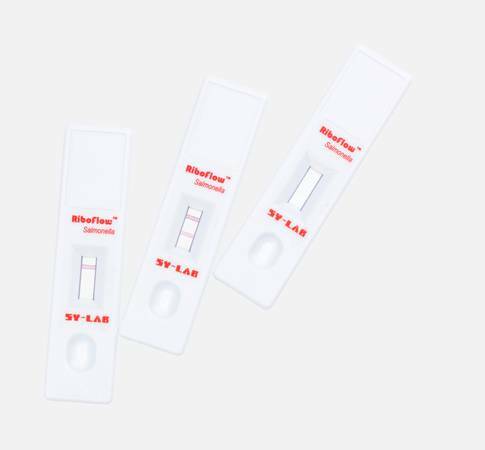 RiboFlow Cronobacter in combination with the optimized media from SY-LAB Geraete GmbH also detects lauryl sulfate sensitive Cronobacter strains which would yield false negative results in the standard method.